For more information, go to Friends Of Port George Lighthouse on Facebook. White, square, "pepper-shaker" wooden lighthouse with a red lantern, 25 feet (7.6m) high . 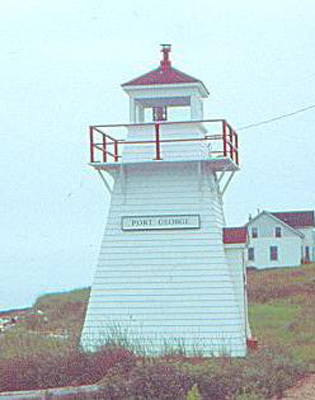 A light has guided mariners to shelter since the first wharf was built at Port George in the 1880's. First, there was a temporary light, presumably a "pole light" - a kerosene lantern hung on a pole near the wharf. When the East wharf was constructed in 1889, the first "real" lighthouse was built on the end of the wharf. The fixed red light was lit by kerosene. Each evening the lighthouse keeper cleaned the shade, trimmed the wick and lit the lamp. In the morning he would have to return to the building to blow out the light. The kerosene was brought by a large boat which anchored offshore and lowered a smaller boat to bring in several 45 gallon drums of kerosene. These were stored in the lighthouse for future use. 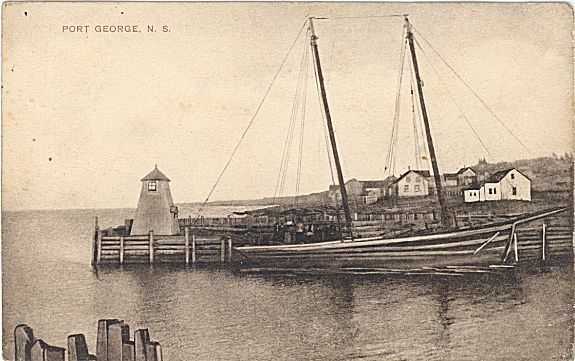 From 1860 to 1875 much of the trade for the Annapolis Valley was shipped into Port George. The surrounding villages were prosperous. Ship building was very successful and fishing was a lucrative occupation. Later, the building of the railway and other economic factors changed the industrial life of the villages but one thing was constant - the shining beacon of the lighthouse. In the 1930's, the East wharf deteriorated, and the lighthouse was moved up by the roadside early in that decade. An article in The Mirror, of April 1975, stated that "during a storm which destroyed the remainder of the East wharf, the men who lived in and around the Port managed to haul the lighthouse out of danger to a place along side the Shore Road." When electricity arrived at the shore, the kerosene lamp was replaced. Now a sensor electric bulb ensures that the light shines from dusk until dawn. The lighthouse still stands by the Shore Road, In 1997, the Port George District Lighthouse Society was formed to begin the process of purchasing the lighthouse, which had been declared 'surplus' to the needs of the Department of Fisheries and Oceans. On May 3, 2002, the ownership of the lighthouse was transferred to the society. The lighthouse is still a focal point of the community and is undergoing restoration. 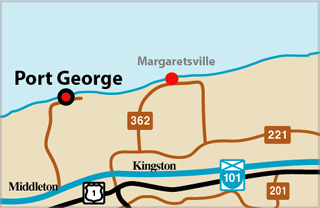 Located on Shore Road near the village of Port George on the coast of the Bay of Fundy.